Does this machine match your room decor? This has Parents Magazine seal of approval. 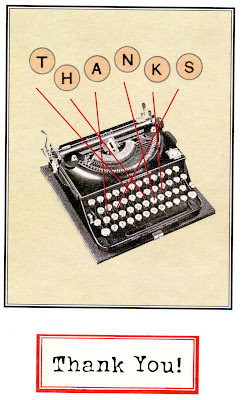 I know many writers that love this machine. I always enjoy your posts, thanks Tom. Lightweights can be fun and portability does make perfect sense for students. I do have a Royal Caravan faux bois that looks identical to that Fleetwood. I enjoy typing on it and I love the 70s vibe, but it will have to go to make room for Olivetti fever. 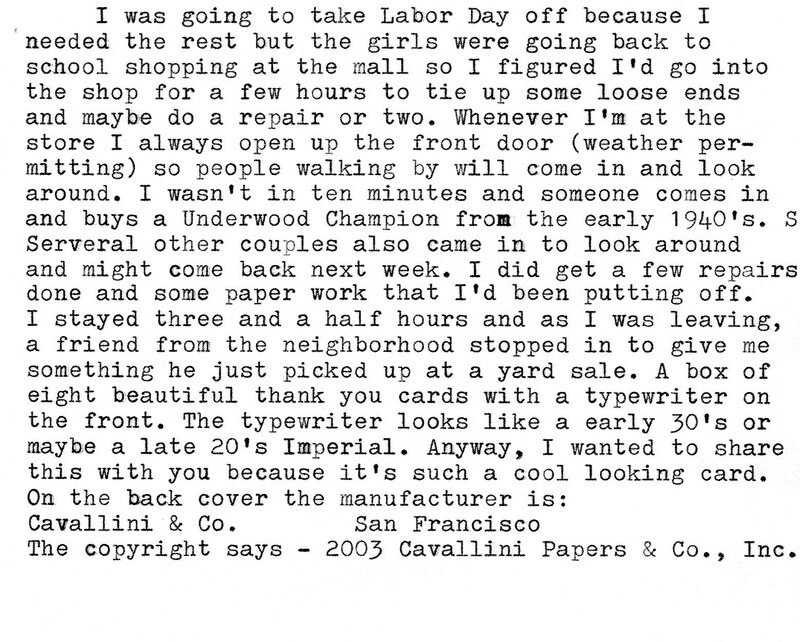 ( : I do have one more non-Olivetti lightweight yet to be revealed. I snagged an unused Underwood silk ribbon with that very same Japanese geisha design. 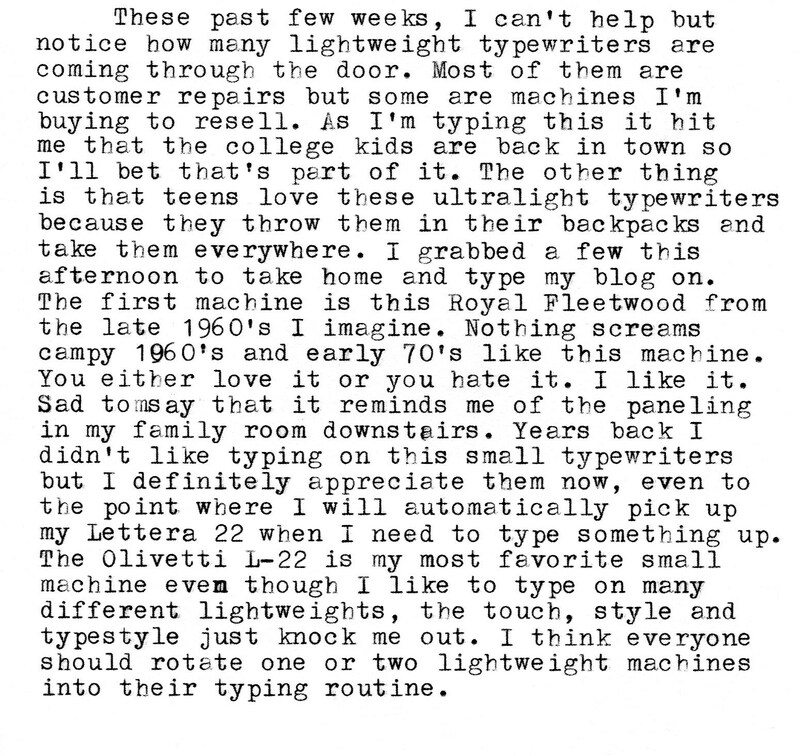 I put it in my Olivetti Studio 42. Nice variety of items in this blog post, thanks. I'd say my favorite lightweights are the Olympia SF (I like the rounded circa-1960 look), the Groma Kolibri, and the Lettera 22. This is the first blog I ever followed, and it remains a favorite. Always excited to see an update! I love the lightweights. 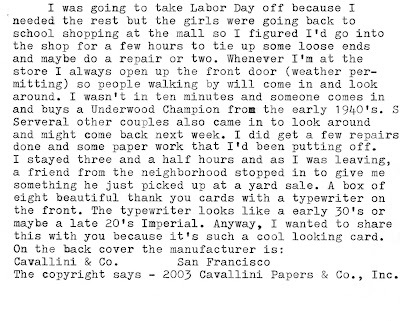 Personally I have two Adler Tippas, a Hermes Rocket, and two Olivetti Lettera 32s. I used to own a Royal Sprite similar to the one pictured. It didn't quite fit into my backpack like the others. Really want to try out an Olympia SF. It might be tops on my list now that I have a Corona 4 finally. 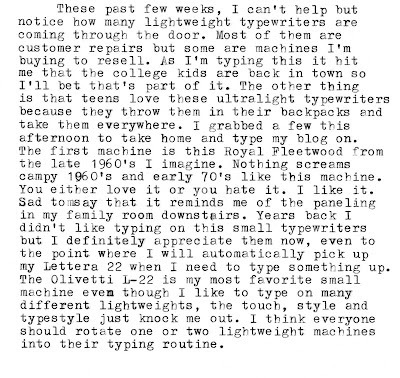 Great post on lightweights -- I enjoy typing on them, too, as a change of pace from the larger models. It is a great little typer except for the very annoying quirk of the ribbon bunching almost every time I shift. For the life of me I cannot seem to figure out how to fix it. Ton- Glad you enjoyed. Doesn't everyone have Olivetti fever? 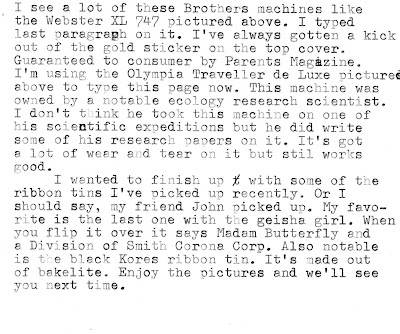 Richard- I really like the Olympia SF/Splendid models. I just picked up a Groma Kolibri but it needs repair before I try it out. Mark- Glad you found my blog. Sounds like you have a nice collection of lightweights already. You shouldn't have any problem finding a nice SF model. There are lots of good around. Cameron- Thanks for your comments. Lightweights are a great change of pace. 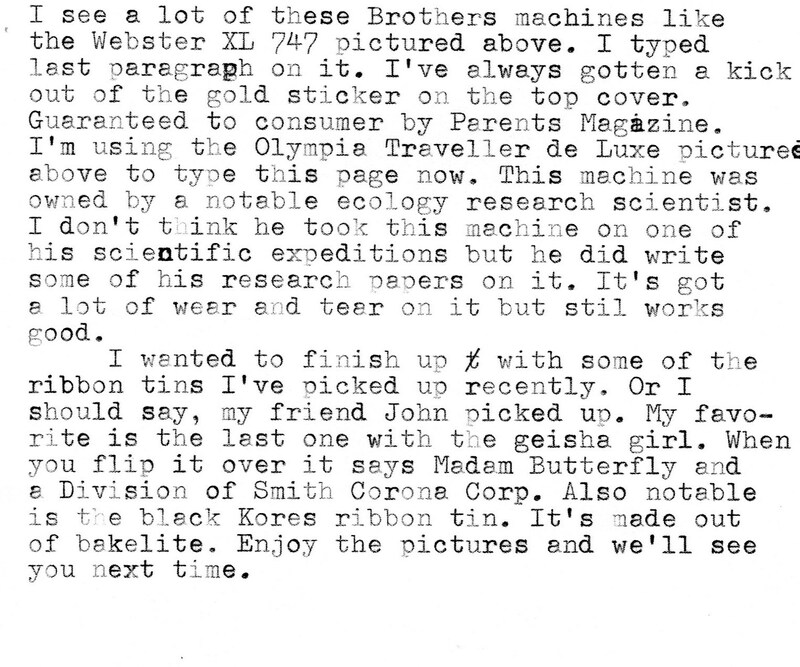 The ribbon problem with the Webster is strange. Might be a problem with too much slack in the ribbon feed or not enough?